Managing to live comfortably without regular paycheques coming in… can be a daunting proposition if not planned well in advance. Financial security is the essence of a happy retired life. Planning for a content retired life in itself requires careful planning. 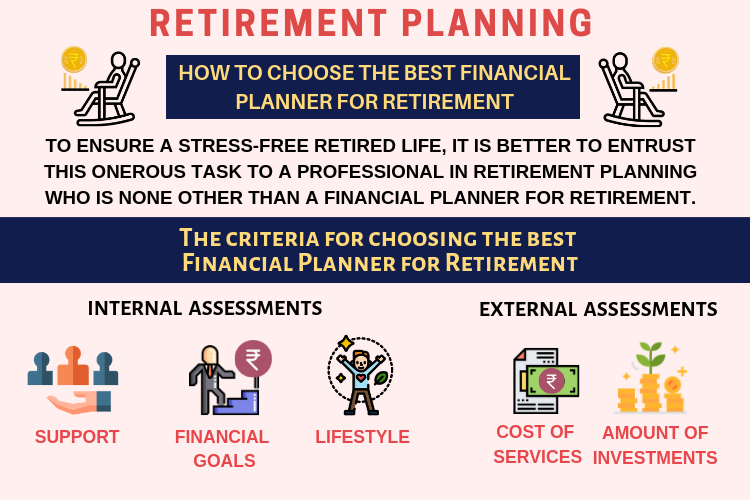 To ensure a stress-free retired life, it is better to entrust this onerous task to a professional in retirement planning who is none other than a Financial Planner for Retirement. Choosing a financial planner for retirement, as per your requirement and affordability, needs some guidance. There are a lot of financial professionals who peddle their trade out there, but in order to choose the right one, it is necessary to assess a few financial planners against a set of benchmark yardsticks. The selection could be done on the basis of a two-way analysis. One would be internal and the other external. • The internal part would involve an objective assessment of individual requirements. • The external one would be about deciding a set of the criteria on which each prospective financial planner for retirement would be assessed. 1. Find out the type of support you need: Regular or Need-based? It is good to have a clear idea about the specific requirements that need to be addressed post-retirement. For some people, it would be fine to have a financial roadmap for a period of say 5 to 10 years from the date of retirement in the beginning. In such a case, the professional charges of the financial planner for retirement would be one-time to start with. Instead, if there are issues which need detailed planning and monitoring on a regular basis, the charges could be based on the number of sessions which the financial planner has to devote. 2. Spell out the financial goals to fulfill after retirement. Before embarking on the quest for the perfect financial plan it is imperative that the major financial responsibilities and goals be documented. The financial planner for retirement will need all the inputs in order to draw up the best plan. It is possible that at the time of retirement an individual has an outstanding home loan and money needs to be set aside for children’s higher education and/or marriage. In such a case, the financial planner for retirement will take all of these into account to draw up a time-bound plan. 3. Decide the kind of lifestyle to be maintained. Deciding on the lifestyle requirements post-retirement is one of the most important parameters for computing the monthly income requirement. Post retirement, you may have some regular pilgrimage trips and frequent visits to relative’s places. This may increase your travel cost. Similar other needs like tour, entertainment, dining outside and hosting parties/events need a re-look. A fiduciary must have the best interest of his or her clients in mind. 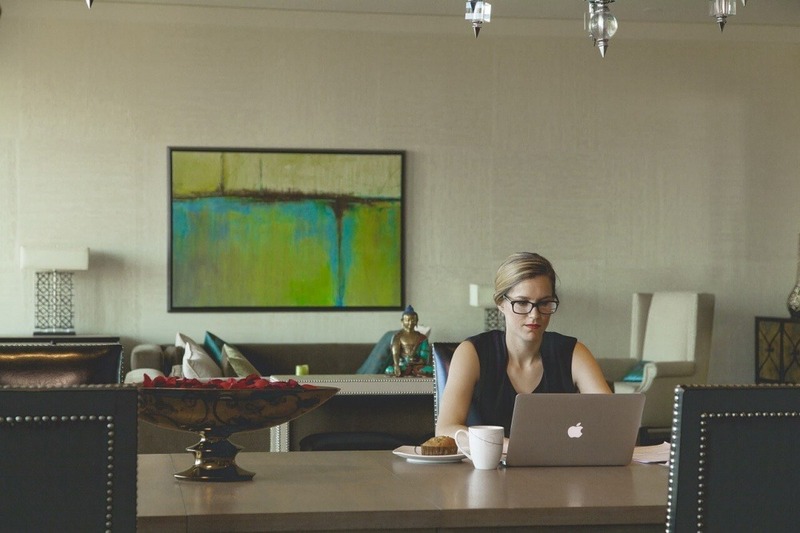 In general, three types of financial advisors are seen to operate: The commission-based financial advisor, the fee-based financial advisor, and the fee-only financial advisor. It is the last category of advisor or financial planner that a retiring individual so looks up to for doing the retirement plan. As the name signifies, the first two categories of advisors or agents look to sell insurance and other financial products for which they receive a commission or fee and hence they will always operate with a bias. So even if the ‘fee-only’ financial advisor is more expensive it is important to seek their advice. 2. How much will they charge for their services? The cost of services provided is one very important factor for deciding upon a particular financial planner for retirement. Some planners only recommend and advise on what to buy or sell, and there are others who help to do the same on behalf of their clients. • Assessing the post retirement income required. • Computing the corpus required to take care of inflation adjusted post retirement income for the individual and his/ her spouse till their life expectancy. Each type and form of service has a different cost and the same should be looked into carefully before arriving at a decision. 3. What kind of clients have they been servicing? If the financial planner is an expert on retirement planning then he is best suited for the purpose and his work portfolio will go a long way in boosting a prospective client’s confidence. 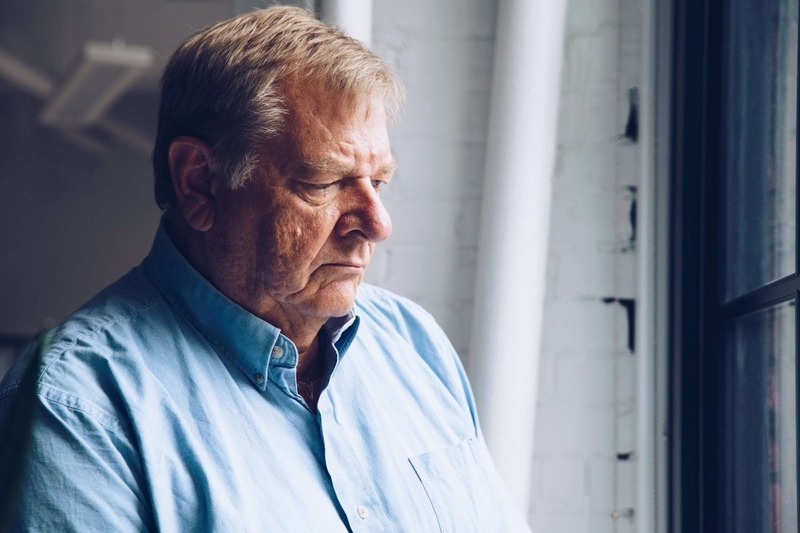 Working with different kind of retirees, for example, there are many who are extremely risk averse at the point of superannuation, trying to protect all their hard-earned money gathered during the lifetime. In such cases, the financial planner has to draw up a plan, which might not be great on returns but will be safe. Again there are some who would keep a major part parked in safe options while utilizing a portion to see if the returns are good. The financial advisor in each case needs to find out the preferences and work accordingly. 4. What is the average amount of investments handled? The spread of investment, the highest and the lowest would give a fair idea as to the exposure of the particular planner in handling large to small investments. In all likelihood, most retiring individuals would prefer to be somewhere in the middle. 5. What kind of investment strategy do they propose to apply? All retirees should allow the financial planner for retirement to give their pitch. • A simple question like “what kind of investment strategy do you choose for different clients?” will do the trick. The financial advisor could then spell out the exact path for investments to be made, which they have in mind. • It will also provide an insight into the returns, which the individual can look forward to in the short and long term. • It could help in understanding how best to go about if there is a major financial commitment after retirement and how best to tackle the same. As a client, one could then assess the inputs received and compare them with their own thoughts and ideas. be so invested that the returns can last at least until the age of 82-85 years. 6. Why do I need to consider you as my ‘Financial Planner for Retirement’ ? • bring out the uniqueness in the prospective financial planner for retirement. • Discover what they can bring to the table that others can’t. • Get better insights on the way they handle the curves and bends in the financial road ahead which could make the difference. All factors including cost should be taken into account while weighing the decision to go or not to go with a particular financial planner for retirement. 7. Do a background check on the prospective financial planner for retirement. Trustworthiness is a basic quality, which the financial planner for retirement needs to possess in order to qualify for handling the money for retirement. A background check is, therefore, a good idea. • Look for people who have used their services and approach them for feedback. • Check up on different websites that list them as consultants. • Search and check if they have ever been blacklisted by any agency, government or otherwise, for any reason whatsoever. The above steps will help you in finding a good financial planner for retirement. However, before making the final choice it would be a good idea to check with peers and colleagues to see if they have used similar services and what opinion they have regarding financial planners for retirement. Give your Rating for financial planners in a scale of 0 to 100 to the below mentioned questions. 1. Will the Financial Planner work on the best interest of you? 2. Do you think this financial planning offer is worth the cost? 3. Is the financial planner an expert in handling the clients similar to your Age & Income? 4. Is the financial planner an expert with reference to the average amount of investments handled similarly to yours? 5. How suitable is the investment strategy proposed by the financial planner? 6. How is this Financial Planner a better choice comparatively? 7. How satisfied are you with your background check on the financial planner for retirement? Use the Rating Questions above to choose the best financial planner for Retirement from your list of financial planners. Financial Planners with an average ratings of above 70 can be chosen for your retirement planning. A good financial planner for retirement can make a world of difference by ensuring that the days of your retirement are spent peacefully without having to worry about regular cash flow. The earlier one starts to plan for retirement, the better. However, it is never too late to start. But, it will be too late if one does not start at all. Kindly write your comments, and also spread the valuable information by sharing with your family and friends. 99% of investors are not with the right Investment Planners. What about you? Thanks for the tip about finding a financial planner who can offer you guidance. It would be smart to check with their past clients to know how qualified they are as well. My husband and I are looking for a retirement planner, so we’ll have to make sure they are qualified first. Yes Katie, You are right. That is why we have covered that in detail in the 7th point of external assessment. Good article very informative. Thanks, Holistic. I am happy to have visited your website. Your website articles cover the subject indepth and at the same time explains everything in a simple lucid language. Thanks. We take conscious effort to write it in-depth and in lucid language. Really happy that you liked that. It is always a pleasure to write for our readers like you. Thanks Sankar for your feedback. I always read all of your articles. They are really useful. You guys are doing great job. Thanks for your appreciation. It means a lot.